Incoming light reacts with the several types of cone cells in the eye. 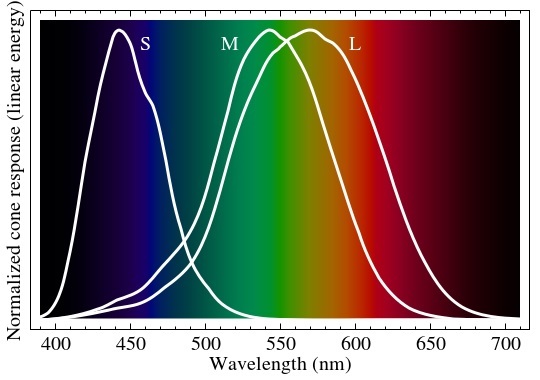 In humans, there are three types of cones sensitive to three different spectra, resulting in trichromatic color vision. Each individual cone contains pigments composed of opsin apoprotein, which is covalently linked to either 11-cis-hydroretinal or more rarely 11-cis-dehydroretina. The opsins (photopigments) present in the L and M cones are encoded on the X chromosome. A very small percentage of women may have an extra type of color receptor because they have different alleles for the gene for the L opsin on each X chromosome. X chromosome inactivation means that only one opsin is expressed in each cone cell, and some women may therefore show a degree of tetrachromatic color vision. Tetrachromacy is also demonstrated among several species of birds, fish, amphibians, reptiles and insects. Humans cannot see ultraviolet light directly because the lens of the eye blocks most light in the wavelength range of 300–400 nm. So, besides above mentioned exceptions, is it possible due to mutations or genetic engineering to see UV or infrared. What kind of mutations should be made or are the changes to be made in the opsines to big to create 'alien' eyes? The ability for retinal-binding proteins to absorb far-red (between 700nm-850nm) light has been experimentally confirmed in this paper. 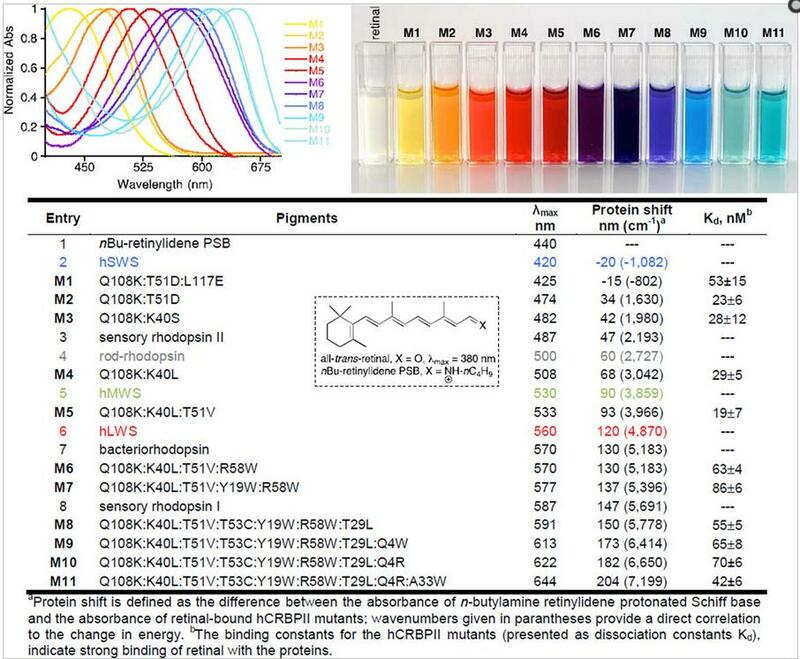 While the authors did not attempt this in vivo in an animal model, they managed to use directed mutagenesis to induce a significant shift in the absorption peak of the chromophore of the retinal binding protein. The authors show the shifts induced by these mutant proteins in the figure below. The mutants have significantly different absorption peaks, and assuming that the proteins do not lose their ability to transduce signals via optic nerves, they would allow vision in different wavelengths. It is known that humans lacking a lens (aphakia) are able to see ultraviolet light. As noted in the question, the lens blocks out long-wave UV, and its removal or absence results in ultraviolet vision (although with low sharpness due to the lack of a lens). However, aphakic patients report that the process has an unusual side effect: they can see ultraviolet light. It is not normally visible because the lens blocks it. Some artificial lenses are also transparent to UV with the same effect. The receptors in the eye for blue light can actually see ultraviolet better than blue. Military intelligence is said to have used this talent in the second world war, recruiting aphakic observers to watch the coastline for German U-boats signalling to agents on the shore with UV lamps. Does every human eye see the same visible spectrum?